Busy homemakers rejoiced in 1957 when Pillsbury offered a new time-saving treat: refrigerated cookie dough. 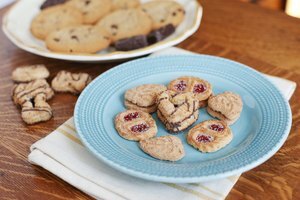 While cookie mixes first hit the market right after World War II, Pillsbury’s dough was the first that could go straight from the packaging to the cookie sheet. The problem with using store-bought cookie dough, though, is that it often doesn't taste as rich as homemade cookies. But if you make a few clever alterations, you can fool almost anyone’s taste buds (even your own) into believing they’re homemade. Place the dough into a large mixing bowl. Let it warm slightly to room temperature so it's easy to work with. Add a couple of teaspoons of packed brown sugar and 3 to 5 tablespoons of softened butter. 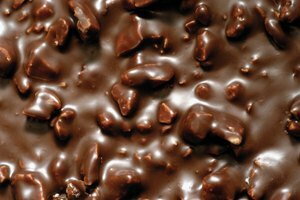 Add candy crumbles, small pieces of dried fruit, or exotic nuts. Mix well. Don't be afraid to experiment with unusual mix-ins to give the cookies more "homemade" character. Add about 1/2 teaspoon of flavored extract and knead it into the dough well. This gives the dough a “custom” flavor. Try adding cherry extract to sugar-cookie dough or mint extract to chocolate chip dough. Cover the bowl with plastic wrap. Chill the dough for 12 to 36 hours to deepen the added flavors. Spoon dough onto a cookie sheet. 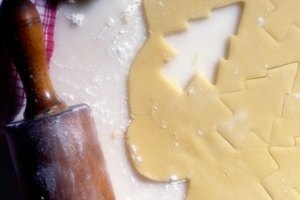 Make the cookies as large or as small as you’d like, but remember that they'll spread as they bake, so leave a couple of inches of space between each one. Sprinkle a pinch of sea salt over the top of each cookie for even more flavor dimension. Bake the cookies as directed by the dough’s packaging. Keep the oven’s interior light on so you can monitor the cookies during the final few minutes of baking. Get creative with your add-ins. Try instant espresso, cocoa powder, cream cheese, citrus zest, coffee powder, quick-cook oats, dried spices, or even crumbled bacon. 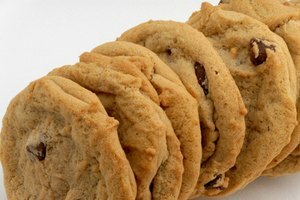 King Arthur Flour: The New York Times Chocolate Chip Cookies: Smarter Cookies?